Speak with Grubfoot at the Goblin Mines. 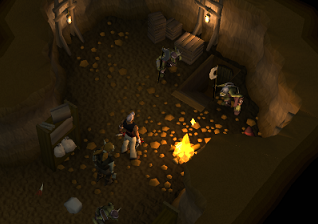 To start this quest, head over to Lumbridge Castle, enter the basement and have yourself transported to the Goblin Mines. Make sure you have your light source in your inventory unless you want an untimely death to fall upon you. 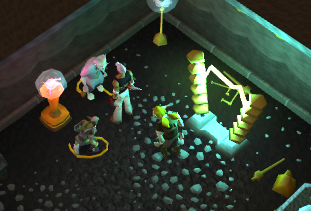 Once at the entrance of the mines speak to Grubfoot, your friendly armor model from a previous quest. 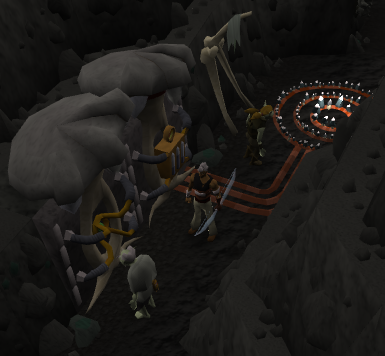 Grubfoot desperately wants to speak to Zanik and to do so he will have to enter Dorgesh-Kaan. Sadly, Mistag informs him, this is not possible. Unless... You accept responsibility for him. This you will of course do, and together you can enter the city. You will have to find Zanik and, rather than trying to locate her by wandering around, you now make your way to Oldak, your kind Teleport Sphere maker. He is located in the room at the north-west end of the city. Once there speak with Zanik, and introduce Grubfoot to her. Grubfoot will relate a story about his recurring dreams and more particular a new dream he had recently. This dream, apparently, was important enough for him to risk the wrath of his fellow goblins and seek out Zanik. Grubfoot is sure about one thing: It could be Zanik's destiny to lead the Goblins to a new era of peace. Both of you are now impatient to hear the story about his new dream, and rather than telling the story the Blokes at Jagex hand us a cut-scene with pictures of friendly Goblins united in their peaceful existence in a previously unknown area. Grubfoot is sure the priests at the Goblin Temple know the way to this strange land, but before he will tell where this Temple is he wants your solemn promise never to reveal its location. What is more he wants you to promise never to reveal the name of the Big High War God, Bandos. 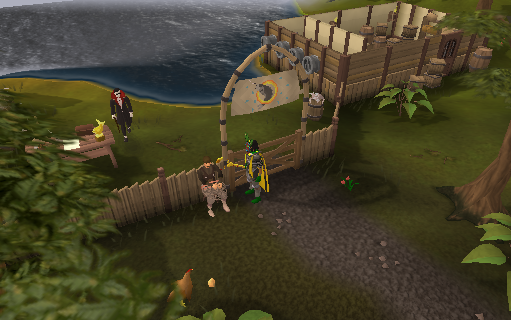 Note: You will need to transport from the quest area to various locations all around Runescape, from Aggie the Witch to Hemenster Fishing Contest area. 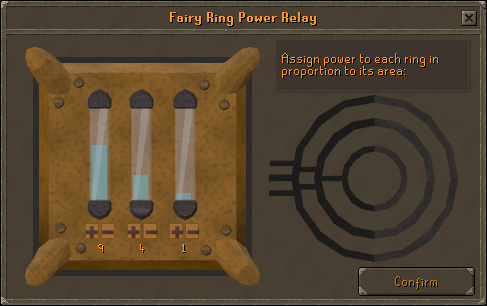 You can have more Spheres made by Oldak for the price of 2 Law Runes and 1 Molten Glass, alternatively you can use a Combat Bracelet or a Skills Necklace to enter the quest area fast. 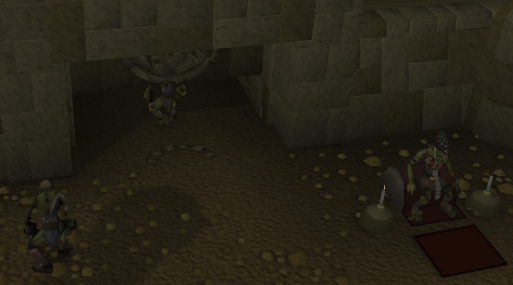 Oldak's Spheres will teleport you to the Goblin Cave next to the Fishing Guild, head in a North-West direction taking the middle one of the three corridors. You will end up amongst Goblins and in the Northernmost room you will find a stairway leading down. This stairway is guarded by two, rather dimwitted, Goblins, and when you and Zanik try to enter only Zanik is successful. You aren't able to follow simply because you are not a Goblin. Since this potion is delicate there are a few restrictions to its use: You cannot wield anything other than wielded by Goblins, you cannot enter combat while looking like a Goblin, and your disguise will be destroyed when entering direct sunlight. Should you run out of it you can return to the Makeover Mage and get the secondary ingredient, Pharmakos Berries, again. Make your way back to the cave and, once inside, take a sip of your newly made potion. 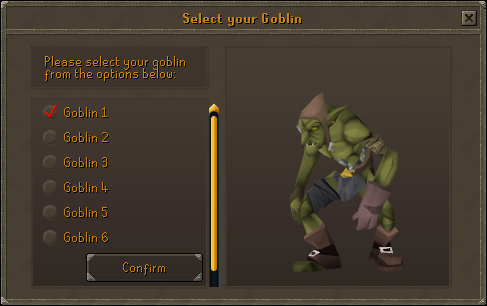 You now are able to change into one of six different Goblins. Anyone of these will do for the next part of the quest. As your Quest Journal tells you, you need to find, and ultimately set free, Zanik. She is located in a prison in a room at the North-West end of the area you are in. To enter you need to dress like the guard: Wielding a black Goblin Mail. If you want you now can take a short-cut in the quest, by talking to the High Priest located just north of the altar and taking a test. This test consists of a number of questions and you need to pick the right answer to each. But remember this: you need to click through the whole conversation before taking the test, you wouldn't know the answers if you didn't. If you would like to read up on the answers to the test first, you can go outside and kill Goblins until one of themdrops a Goblin Book. This book contains information about the Goblin religion, including the edicts of the Big High War God. You can find the answers to the test in this book, or by using the answers below. To which the answer is 'True', the follow-up question, the High Priest really wants to know if you know your stuff, is: 'The Big High War God commands it'. The answer to this one is 'False'. Again a follow-up question to which the answer is: 'Goblins were not mighty warriors before he chose us'. And the answer is: 'False'. This time again a follow-up question with the answer: 'That's one of the commandments'. And its answer: 'Lead Goblins to victory all over the world'. You now are able to extract information that matters from this High and Mighty, ask him about Zanik, about the rooms, about Yu'biusk and store that information in your mind, or don't, it doesn't matter, as long as you click through the whole conversation it is ok.
Go outside again and enter the small room at the Western side, pick one of the mushrooms there. You need it to make Black ink. Right, to free Zanik you will need to access the North-West room, but for the rest of the quest you need to access all other rooms. So it is time to collect some stuff: Various dyes as mentioned in the section 'Items Needed'. The fast way to collect the dyes is to use a Tiny Crystal and teleport to Lleyta, the slow way is to have Aggie the Witch make you various colors. One thing you need to do is this: Talk to Aggie (even if you buy the dyes in Lleyta) about white dye. She is not able to make that but can make a kind of bleach to remove all color from a Goblin Mail. For this you need a Whitefish. You can catch this Whitefish at the Hemenster Fishing Contest area. The bait used is a Slimy Eel. These can be caught in the Lumbridge caves using a fishing rod and bait, right-click the fishing spot and choose 'bait fishing spot'. Time to get the ingredient for the 'white dye'. Take your Slimy Eel to Hemenster and try to enter the Contest area by opening the gate. It will not work if you try to talk to the contest master. You now have the option to talk about the Whitefish and enter. Use your fishing rod on a fishing spot and when you have a Whitefish in your inventory you are set to go. Head back to Aggie and have her make the appropriate dyes, or, as a fast alternative, zap over to Lleyta and buy the Purple, Blue, Yellow, and Orange dye there. Then ask her to bleach your armor. Head back over to the cave with this in your inventory: The appropriate dyes, one bleached Goblin Mail, some food, a weapon and armor to fight five 'bosses' up to level 75 in succession, your transmogrifying potion. For those with a low combat level: Take some decent armor, a good weapon, some good food, and some potions. Remember you cannot wield anything while you are a Goblin. Only when the fight starts you can slip into your armour. 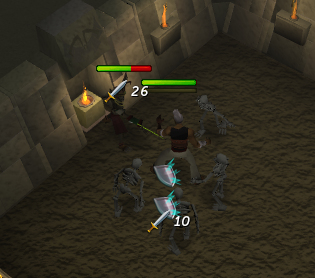 One more thing: While in the crypt you can teleport out with normal magic, Item teleport, or teletab. Home teleport does not work. In the cave take a sip of your potion and morph into a Goblin again, enter the Temple and head for the room with the white dressed Goblins. Slip into your white armor and talk to the Guard, who will let you pass. Pickpocket a priest to get a key. Exit, take off your Goblin Mail and use the Black ink with it to dye it black. Go to the North-Eastern room and again speak with the guard to enter. Head to the back of the room and speak with Zanik. Her Teleport Sphere was taken from her and stored in the near-by crate. Search this crate and give the sphere to Zanik. She will leave for Dorgesh-Kaan and leave you with the rest of the mess to sort out. Again, pick-pocket the Priest to get your second key. Once you have all six keys it is back to the main room. Click on the door behind the High Priest. A cut-scene will follow and the door will open, revealing the burial grounds of previous High Priests. In this room there are five different places where you can 'say-name'. What you do with this 'say-name' is wake-up one of the priests who will part information to you regarding Yu'biusk. The first name you need to say is Snothead and will wake a level 19 High Priest. 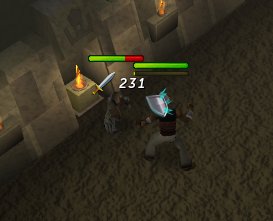 Though it might look dangerous in the picture it is a fairly easy fight, depending on your combat level. Time to head back to Dorgesh-Kaan and the grand finale. Find Zanik and Oldak in that familiar room in the North-West corner of the city. Relate to them what you have learned and Oldak will think of a way to access this 'other plane of existence'. 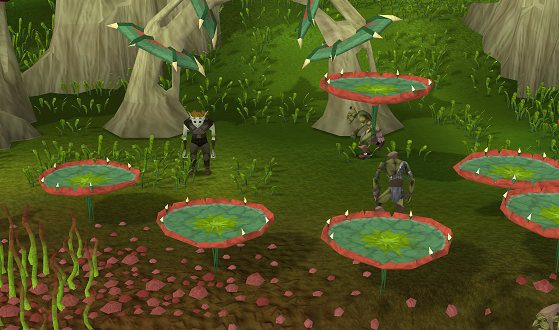 Oldak thinks up a way to use the Fairy Rings with the help of some complicated machinery. Then he tells you to meet both him and Zanik at the Fairy Ring South of the city. To get there, go to the second floor and walk all the way South. Climb up the stairs at the end and then down the ladder at the western side. Walk South and follow the first corridor East. Your radar will show where the Fairy Ring is located. 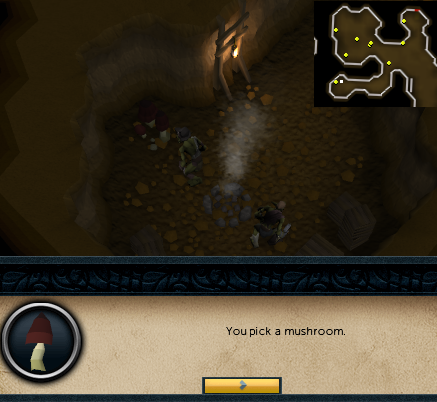 Alternatively, teleport to the Yanille lodestone and run north, and then use the fairy ring code AJQ. The complex machinery created by Oldak, though experimental in nature, seems to be working. But Oldak will need your help controlling the energy used to open the portal to the other plane. Though this sounds very complicated but all you need to remember are these numbers: 9 4 1. Click on the control panel and you will see this picture, make sure you have the numbers correct and off you go. All three of you will end up in what was the beautiful land of Yu'biusk. Sadly Bandos got his hands on it and this devastation needs to be investigated. Head West until you see a large Sarcophagus like structure. Both you and Zanik will try to open it... And Zanik vanishes. Sadly this is where it ends for this episode, Oldak has no way of opening the portal again, since it has become 'resistant to his machine'. 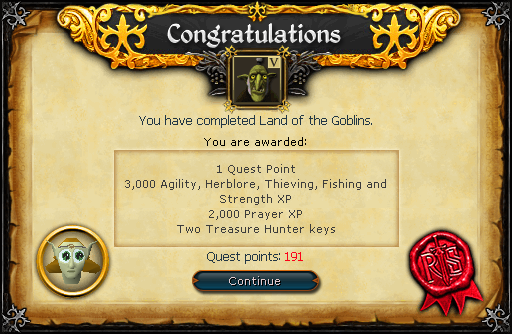 Still, for this episode of the series it is Quest Complete! 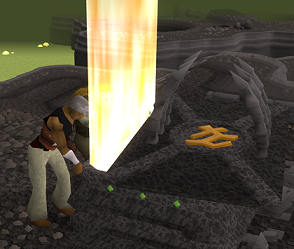 Use your Ring of Visibility and Ghostspeak Amulet on each boss and bury their bones in Yu'Biusk to receive 13,750 Prayer experience and access to the Goblin Priests Mini-Quest.